Back-to-back blooms of ‘Van Sion’ in a Michigan garden. When people ask us to identify a daffodil they’ve found in an old garden, a vacant lot, or way out in the middle of nowhere, it’s often ‘Van Sion’. In part this is because ‘Van Sion’ is all over the place. It’s been sold and passed-along for centuries, and it’s so exceptionally tough that it multiplies where many other daffodils can’t even survive. But what makes identifying it difficult is that (1) it’s highly variable and (2) most books and catalogs don’t show you what it REALLY looks like in most gardens, most years. We’re hoping this page will help clear things up a bit. All ‘Van Sion’ bulbs sold in the US today are grown on a small island off the north coast of the Netherlands where the climate is perfect for ripening bulbs which will bloom with the doubling neatly contained within the trumpet. No matter where you garden, that’s what you can expect to see the first year after you plant them, and that’s what most books and catalogs show you. Paradisi in Sole Paradisus of 1629. But every spring after that, most of these bulbs will produce quite different blooms — shaggy powderpuffs with no sign of a trumpet, as in our photos here. And in some years or some gardens, these blooms will be heavily marked with green, or they’ll open gnarled and imperfect. Though they’re weirdly charming, these mop-headed blooms are rarely pictured in books or catalogs. ‘Van Sion’ is also known as ‘Telamonius Plenus’. Some people call it ‘Butter and Eggs’, but that name actually belongs to another, neater double daffodil that has also been grown and loved for centuries. See the true ‘Butter and Eggs’ here. If you want to delve deeper, here’s some commentary from two leading daffodil experts of the early twentieth century. We’re not sure we agree with either of them completely, but both offer helpful insights on this puzzling classic. 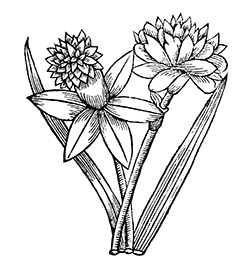 “The origin of this common Double Daffodil is as much a mystery as that of wheat, the potato, and many of our most useful plants and domestic animals. No single-flowered form that would match it in color and texture is now known, though the double form is scattered all over the temperate regions and frequently occurs as a naturalized plant in meadows and out of the way places, as a remnant of some long vanished garden. I received bulbs of it collected in wild ground near Salonica [now Thessaloniki, a city in the north of Greece]. depending on the weather, etc. 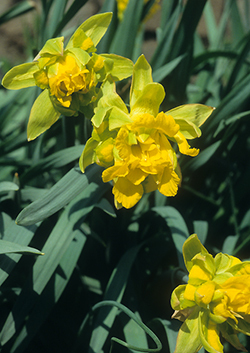 “This famous double yellow daffodil of old American gardens is also very popular in Europe under the name of Wilmer’s Double Golden Daffodil and among the more botanical as N. telamonius plenus, it being the doubled form of a single yellow large trumpet called Telamonius in England and Van Sion in Holland. “It is not only the most important of all doubles, but probably the most important of all varieties, single or double. It is planted by the millions annually. 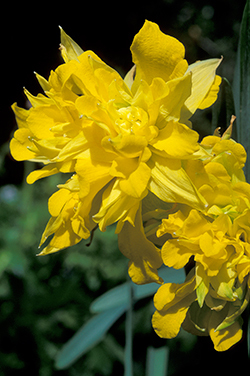 It is generally a reliable producer of large handsome double golden-yellow flowers under varied cultural treatments, soils, and climates whether grown in garden borders, naturalized, or forced in pots or ‘flats’ for winter flower. “Like its parents, Double Van Sion varies in size, form, and other characteristics accordingly as influenced by environment. Years ago when there was less demand for Double Van Sion, the growers of flowering bulbs propagated and disseminated their own types of ‘pedigree’ strains, and there was much rivalry among the growers as to the merits of their respective stocks, some having ‘rogued’ to the unburst double trumpet type, others to the ‘rose double’ form, i.e. 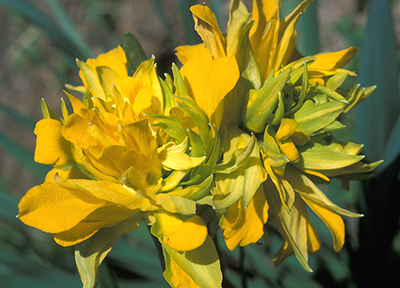 trumpet burst, its petals curving backwards and intermingling with the perianth segments. Between these two extremes were several intermediate forms. But now no one grower seems to have a specialized type . . . [and] we therefore do not get the percentage of ideal double unburst trumpets in our Double Van Sions that we did a few years back. . . .
“[The Dutch growers] will never admit anything wrong in their strains, but insinuate that the grower has actually brought into being such types of flowers by cultural mismanagement. And yet I know of double trumpet daffodils in old gardens that have annually produced flowers with unburst trumpets for many years, regardless of the too sudden changes from winter into summer.